Armature object in Blender is exported as a Skeleton node along with rest position (transform in Godot) of bones. Blender put rigged mesh vertices which has no bone weights at its original position, but these vertices would be placed at (0, 0, 0) in Godot, making the mesh deformed. Therefore, the exporter would raise an error for any vertex with no bone weights detected in a rigged mesh. Note that the non-deform bone can be configured as not exported by enabling the Exclude Control Bones; the deform bone checkbox is shown in the picture. 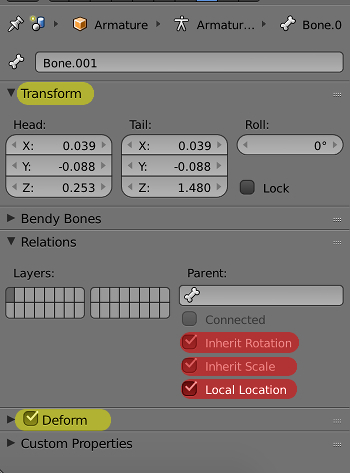 A bone can be the parent of an object in Blender; this relation is exported as a BoneAttachment node in the Godot scene.